Setting the table a bit more, this post takes the form of a book report, such as on the jacket of a hardcover. Real learning and teaching lessons are in the book, and for site visitors, lessons are reviewed here, https://casf.me/casf-monthly-meeting-presentations/, the 19 January 2019 presentation. There’s so much useful material in Kehr’s book, I only got a quarter of the way through during the January 2019 meeting; this post only touches the surface. For me, serious material began with the chapter starting, “Recent History of the Earth,” Kindle p 24. Plate Tectonics was unknown during my Geology undergraduate years at Rutgers, sophomore year began in 1959 with Physical Geology; we graduated June 1962. We now know plate tectonics opened Drake Passage, opened Tasmanian Passage, isolated Antarctica from South America and Australia, enabled development of the Antarctic Circumpolar Current and the Southern Ocean, and caused extensive global cooling. Some of this material is shown in the meeting graphics, Slides 29-31, link above. Opening Drake Passage triggered cooling of Antarctica because warm, moderating influences of tropical and subtropical ocean waters was no longer anywhere adjacent to Antarctica. The fall in global temperatures caused changeover from Eocene Epoch to Oligocene ~35 million years ago. Figure 1. Time series of deep ocean temperature decline helps define onset of the earliest Oligocene ~35 million years ago. Temperatures were determined from deep ocean sediments from south Atlantic and Indian Ocean using Oxygen18/Oxygen16 ratios. Perhaps controversial in the 1960s when first proposed, plate tectonics upset the “settled consensus science” of fixed continents prevalent in my undergrad years. 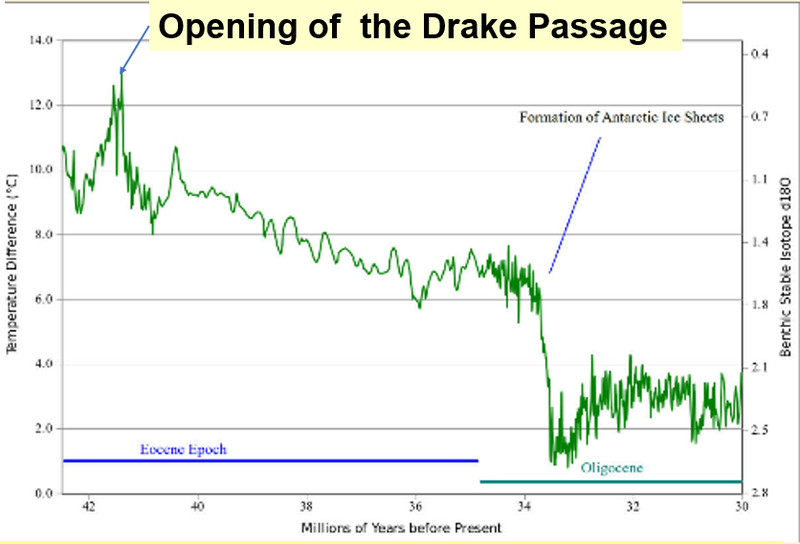 Now mainstream, I show several references displaying the opening of Drake Passage, including outstanding graphics from Dr Chris Scotese’s Paleomap Project, http://www.scotese.com/, my graphics 34-39. After explaining onset of widespread ice sheets and glacial masses in Antarctica 35 million years ago, Kehr gets to the present Ice age, the Pleistocene, which beset the Northern Hemisphere some 2.6 million years ago. The Pleistocene has periodic glacials with extensive continental ice sheets, and warm interglacials when they melt back. Paraphrasing Kehr, “Glacial cycles the past 2.6 million years took place on two different time scales. During the initial period, cycles took ~41,000 years. Using today as zero temperature anomaly, the temperature range of Earth during the 41,000-year cycles was from -6C to 0C. 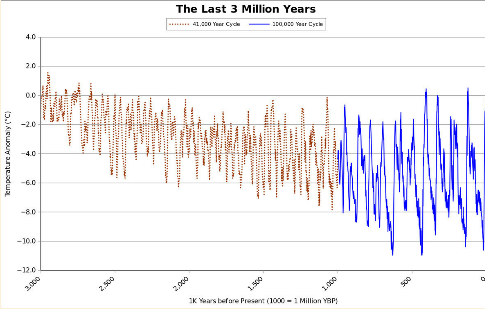 Cycles behaved that way from the start of the current ice age until a million years ago. Figure 2. Temperature history of last 3 million years, the Pleistocene, with widespread ice sheets over Northern Hemisphere continents during glacial periods and receding glacial ice over the Northern Hemisphere continents during interglacials. Each time temperatures increase, it’s the start of an interglacial; each time temperatures start to decrease, it’s the start of a glacial. Brown temperature trace shows when periods were ~41,000 years; blue trace, periods ~100,000 years. 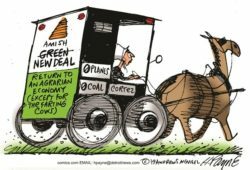 Kehr uses an analogy for comparing glacials, the concept,” this summer vs. last summer,” comparing the present interglacial, the Holocene, with the previous interglacial, the Eemian. Temperatures for these interglacials were derived from Oxygen18/Oxygen16 isotope ratios from the EPICA Antarctic Ice core. Kehr aligns the start month for each interglacial and plots Eemian in green, Holocene in purple. Figure 3. Month-by-month temperature comparison, “Last Summer,” the Eemian, in green, with “this Summer,” the Holocene, purple. Peak Eemian temperature was 4C higher than Holocene’s. Again, paraphrasing Kehr, Last climate summer started 135,000 years before present, YBP, and lasted until 110,000 years YBP. So we’ll use that 25,000-year period as the basis to understand how an interglacial behaves. 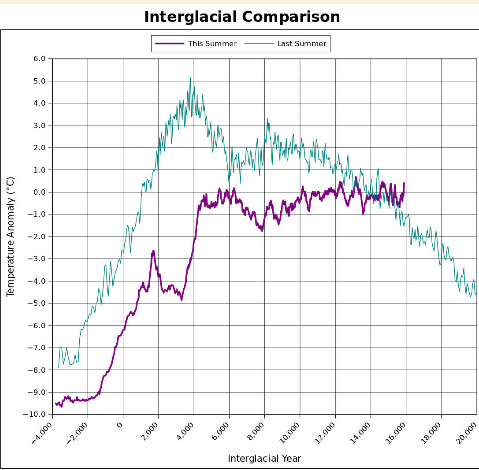 In comparison to the last interglacial, the current interglacial is much cooler than the last one and shows Earth currently cooler now than it was 17,000 years into the interglacial. There’s absolutely no indication Earth is abnormally warm for where it is now in the climate cycle. Figure 4 below plots temperature and CO2 levels during the Eemian. At the beginning of the Eemian CO2 levels were very low, 200 PPM, and temperatures were 8C colder than today. In 6000 years temperatures shot up to 5C warmer than today, a rise rate over 2C per 1000 years. Eemian peak temperatures were so warm Hippos and Water Buffalos thrived in Germany’s Rhine Valley, while CO2 peaked at 285 PPM. After fewer than a thousand years at peak, temperatures fell a couple of thousand years, then rose a bit for about three thousand years. But from then until the end of the Eemian temperatures fell a degree per thousand years, for 15,000 years. CO2 levels climbed in close parallel with temperatures but hardly fell at all for about 15,000 years, when temperatures were falling near the -1C per thousand-year rate. Figure 4. 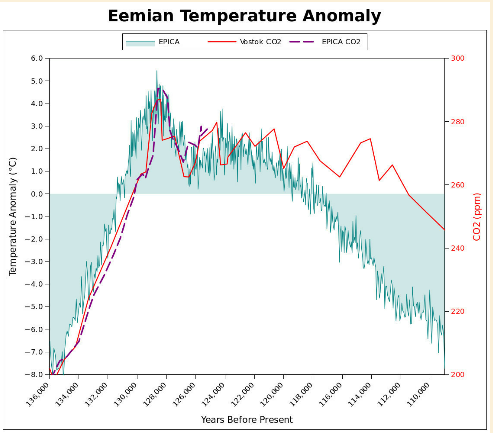 Temperature and CO2 levels over the Eemian. Starting from a low of 200 PPM, concentrations rose to 285 PPM. But, as temperatures fell, CO2 concentrations were very slow to fall for some fifteen thousand years, from about 128,000 to about 113,000 Years Before Present. 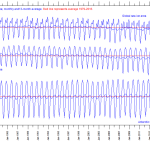 Elevated CO2 levels didn’t stop temperatures from falling significantly. Put another way, dropping levels of CO2 didn’t cause the cooling. Earth was a lot warmer until Drake Passage opened, separating Antarctica from South America and allowing the Southern Ocean around Antarctica to form. A cooling Antarctica allowed snow to accumulate which became vast ice sheets over time; time history of temperatures was derived from Oxygen isotope ratios. The Arctic remained warm and ice-free until about 2.6 million years ago, when warm ocean currents were restricted enough to allow snow, then ice accumulation on Northern Hemisphere continents during ice ages, the Pleistocene. Oxygen isotope analysis shows ~41,000-year ice age periodicity up to a million years ago, and ~100,000-year ice age periodicity since. Using the EPICA ice cores to characterize this interglacial, the Holocene, and the previous interglacial, the Eemian, which peaked 129,000 YBP, Kehr uses the analogy “this summer vs. last summer” to compare the two interglacials. Troubling to the CO2 Theory of climate change, Kehr shows that interglacials start when temperatures and CO2 levels are low, and soon after peak temperature of the Eemian, temperatures started to fall, yet CO2 levels were hardly affected for 15,000 years, over half the time duration of the Eemian. Dramatic global temperature decreases resulted from opening Drake Passage and the separation of Antarctica from South America and Australia. The newly formed Southern Ocean allowed the Antarctic Circumpolar Current to develop, this isolated Antarctica from the moderating influences of waters warmed in tropical or subtropical seas. This began the snow and ice accumulations in Antarctica, ~35 million years ago. Some 2.6 million years ago snow and ice began accumulating on Northern Hemisphere continents during glacial periods, with melting back during interglacial periods. 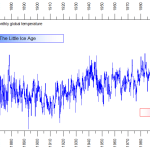 Ice cores provide us time series records of these periods of rising and falling temperatures. Kehr compares the current interglacial with the previous, to examine the notion that CO2 controls temperatures and whether the current CO2 concentrations have caused abnormally warm temperatures in comparison with temperatures recorded by the ice itself in Antarctica. The evidence shows that despite <CO2> over 400 parts per million, temperatures today and rates of temperature change today are not in the least extraordinary in comparison with the previous interglacial, bringing the notion of human-caused CO2-fueled global warming into doubt.